CURRENT GOAL: $110,000 - FREE Hero of your choice! 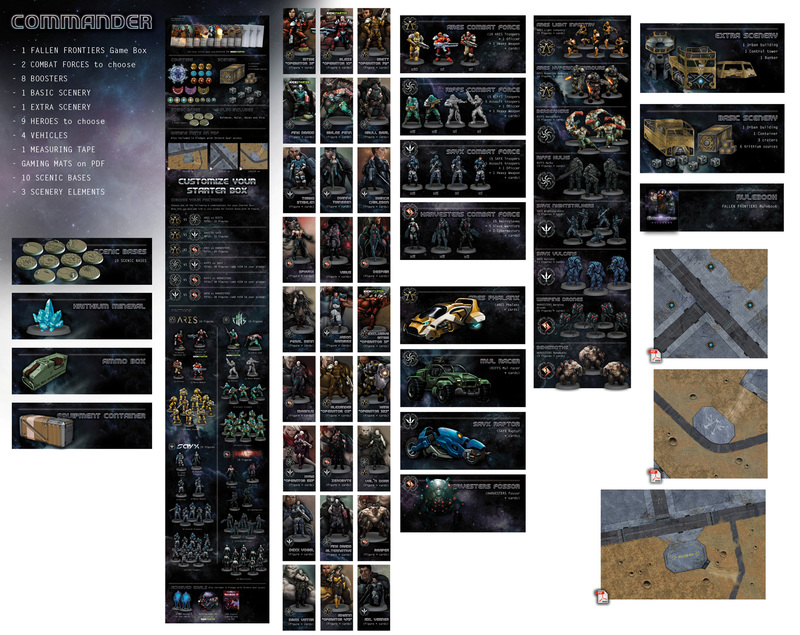 Fallen Frontiers is a miniatures wargame game based on combat squads. The squads offer protection and firepower for the force's heroes. Heroes are the ones that define the game style because their attributes change the characteristics of their squads. Because of this each squad performs differently depending on the hero that leads them. However in Fallen Frontiers heroes are not invincible, but instead are easy to eliminate when they are not with their squad. Besides the miniatures that represent their army, players will also have a deck of cards assembled by them. Since this deck of cards is prepared secretly, players don't know their opponent's strategy, allowing them to change their play style in such a way that opponents will not be able to guess their strategy at first sight. The factions and the cards use up resources to carry out certain actions. 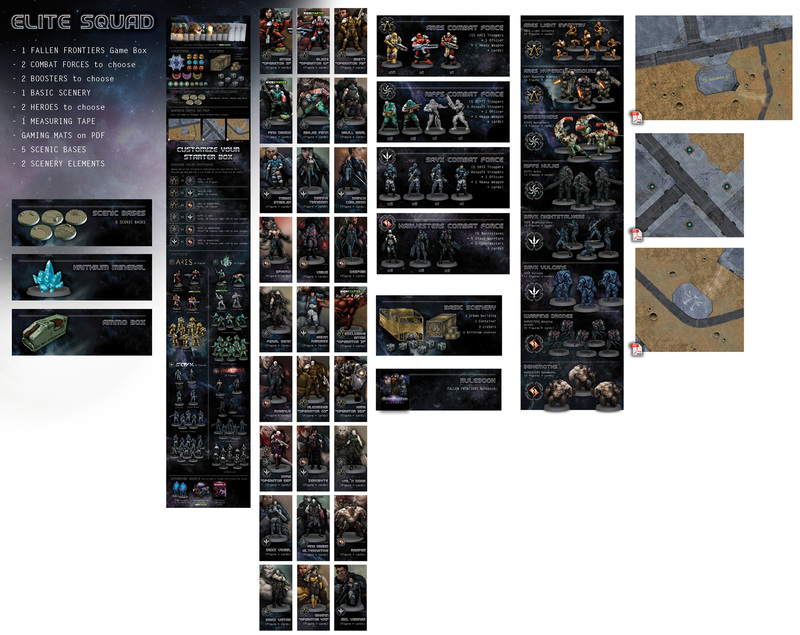 The main resources are Command and Krithium. Players gain Command by holding objectives and maintaining a strong leadership in their army. Using Command points will make an army more powerful and allow players to use their cards. Krithium is a resource that must be collected during the game. It is the source of energy that enhances an army's equipment and cards. The player will have an armory, a separate deck where he purchases equipment, that can be used during the game and consumes Krithium. The contents of the armory is also set up by the player just like the deck of cards. The basic box contains 2 factions to your choice ready to fight. 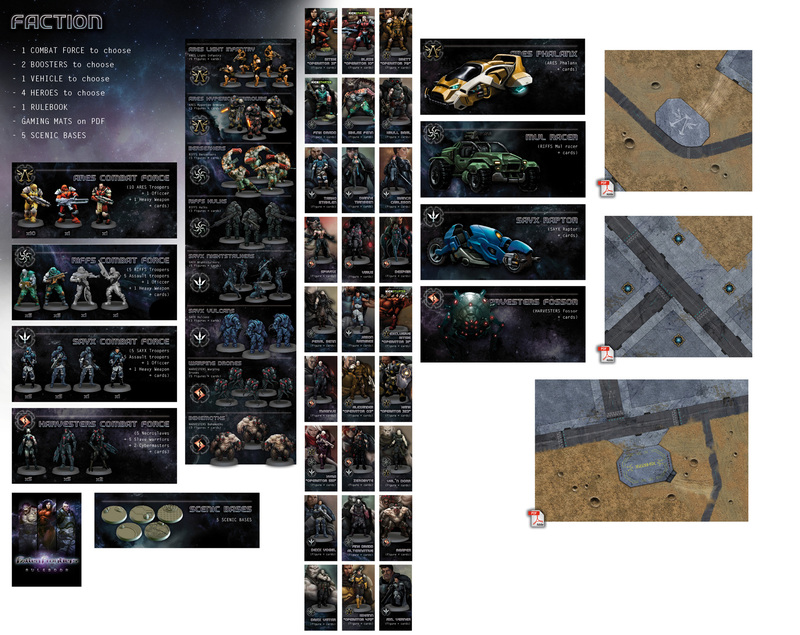 A total of 33 miniatures or more is included, but should the Kickstarter perform well it will end up being much more. It has all you need to start playing: an initial deck of cards, rules, scoreboards, common tables and even colored scenery elements to create the right environment on your game table. The miniatures are of an extraordinary quality and have been designed by both painters and players in order to offer the maximum realism on the table as well as making them easier to paint. The Kickstarter will contain two more factions (Sayx and Harvesters) than those included in the basic box, and improvements on all four that consist of heavy infantry and vehicles. The scale of our miniatures is 35mm to the eyes and are therefore compatible with other miniatures and scenery on the market. This means that a 1,80m tall human in a standing pose is 38mm tall from head to sole, which is also known as 1:48 scale (American O scale). However, being either alien or super humans, some faction models in Fallen Frontiers game are slightly larger than regular humans. Everyone who buys the game box will get an exclusive BACKER LIMITED EDITION that will have a different cover from the commercial version. Inside you will also find four different faction postcards in A5 format, a numbered backer certificate and two exclusive models that will not be sold in stores or online. 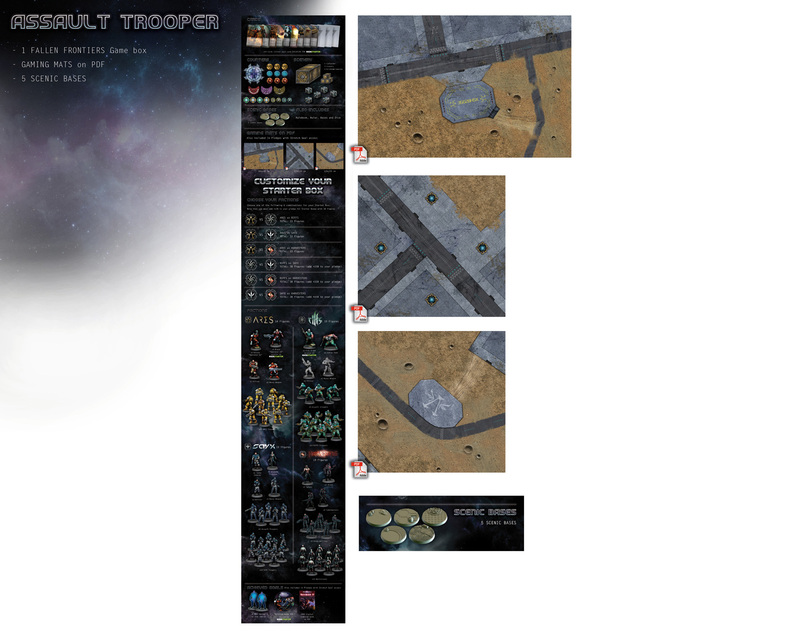 Fallen Frontiers scenery comes printed and ready to assemble and play. All scenery elements are printed on both sides in high density cardboard and most of them are reversible doubling your scenery options. 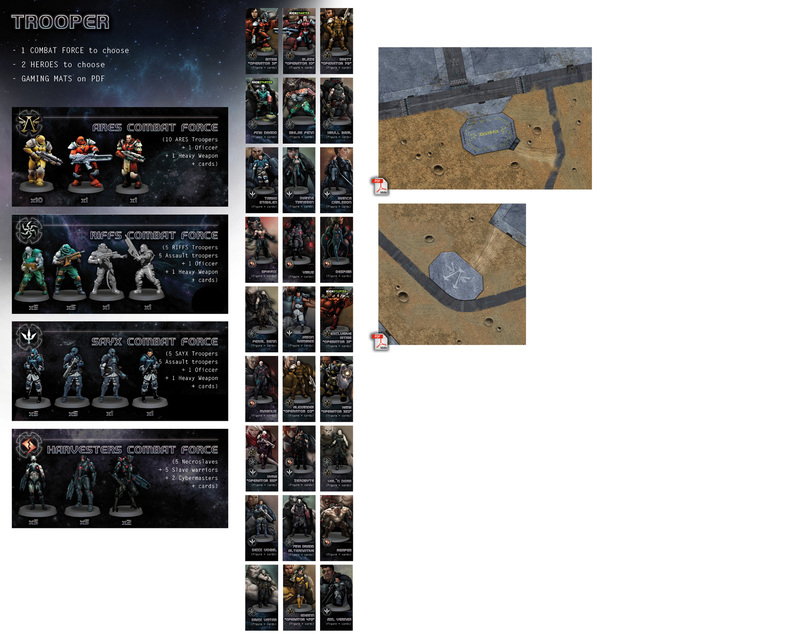 Boosters are elite miniature packs intended to give your army more versatility. For example, adding one or two units of Berserkers will transform your Riff combat force into a deadly close combat army. On the other hand, if you like a shooting army, Hulks will fit perfectly into your riff force capable of soaking a lot of fire while spitting a rain of bullets onto the enemy. 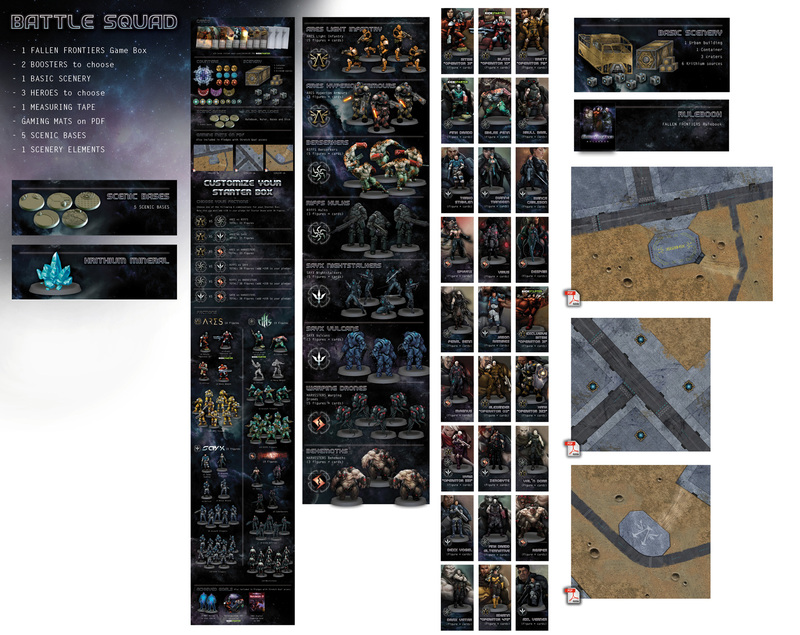 You can get two boosters by choosing the Battle Squad or Elite Squad pledges, and you can get any number as an add on. NOTE: The poses of the final figures may vary. It is a firm decision that the only material we will be using for the production of Fallen Frontiers is Polyurethane Resin. We can produce the miniatures in our factory in Spain, which allows us to have more control over the quality and the production process in a direct manner. We will not have to rely on a third party for production of our miniatures, and we can deliver a finished product with high quality details. It is easy to handle, has high durability, and a light weight for both playing and painting. We want to keep the production cost under control, so we don’t need to invest in expensive tooling for plastic casting, allowing us to significantly reduce our funding goal. This means that anything over the funding goal will unlock more stretch goals that give our backers more options for physical rewards. Scale Games has always strived to produce the very best product in both detail and material, and we feel that the use of polyurethane resin for this project will provide the players and the painters with the best material for the greatest detail and durability. As worldwide shipping costs can vary considerably, and we are unable to predict what your pledge reward selections will be and therefore the weight of your package, we are not including an international shipping fee in the project levels. However, please be aware that you will be responsible for any shipping charges before we can send your package to you. Here you can see estimated rates by region. We will calculate the shipping cost at the end of the campaign and we'll send it to you to validate. Note that shipping costs are paid for each pledge level you take, and are not increased by the amount of add-ons selected. We know from past projects that deadlines of big Kickstarters may suffer unexpected delays, however, our last succesful campaingn Duel Fighters is now on the last days of production and the creative team of painters, modelers and designers is 100 % working on this new challenging project.